The Waterman Pen Company was founded in 1884 in New York City by Lewis Edson Waterman. Waterman was the inventor of the capillary feed fountain pen that we love so much and use to this day. The patent for his fountain pen design was given in 1884 and he worked on the design for ten years before placing it on the market. And the reason for his new design? Frustration at missing a big insurance deal because his (pre-capillary) fountain pen went wrong and leaked ink onto the papers. While fetching new documents he lost the deal to a competing broker. Waterman fountain pens continue to be a sought after brand of fountain pen for Knight's Writing Company. So far we have stocked the Hemisphere in eight different models, including the limited edition Ombres et Lumieres. All models have proven to be extremely popular. Waterman’s pens are considered luxury but they are worth every penny. The nibs are a joy to write with and the pens rarely let you down. If there was ever a fountain pen brand to put your hard earned cash into, then it’s Waterman. For reliability, they are second to none. We have a few more Waterman fountain pens in stock that we will bring to the store shortly. The Expert 3 in black with gold trim, matte black with chrome trim, and stainless steel with gold trim. We also have the Perspective in blue and black, both with chrome trim. And all are beautiful pens. 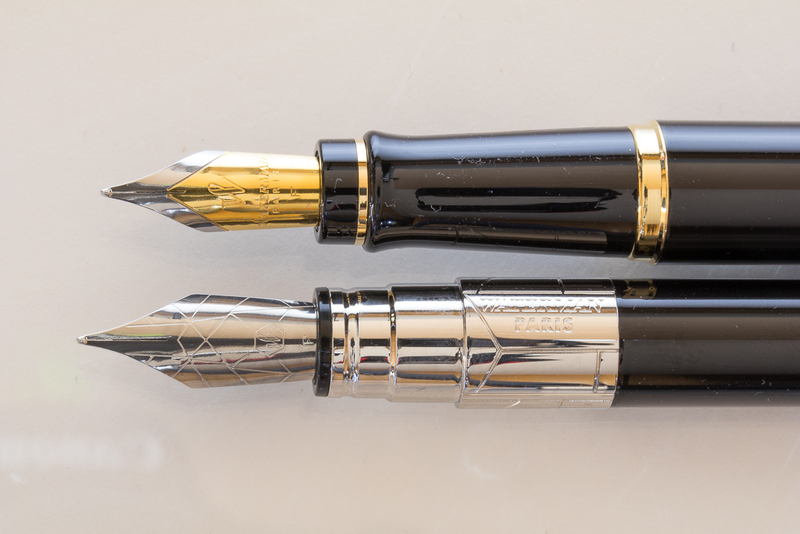 The Expert II has been one of the most popular fountain pens for Waterman. They have a business-like design that exudes high quality. They have been popular in executive circles because of their gorgeous shape and finish. The Expert III is a an updated design with only moderate changes to trim, nib and barrel. 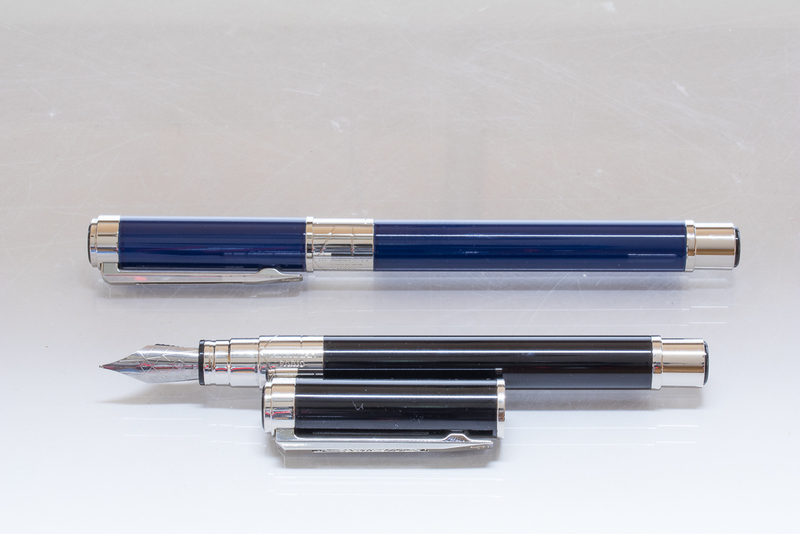 I’m never quite sure why Waterman don’t supply converters with their higher priced pens (there is a long international cartridge supplied with the pen) but these are available separately. The Expert III is a beautiful pen to write with and the nib is sublime. The second Waterman pen we are bringing to the store is the Perspective. This is certainly one of the most beautiful fountain pens that I have seen in a long while. The rather large nib is engraved with lines that match the engravings on the nib section. This is an interesting pen with a uniform diameter for the entire length of the barrel. It has an almost retro-feel to it and oozes a classy, clean design. Both pens lack breather holes in the nib but write extremely well. I would always recommend a higher class ink to use with such a pen, for example Waterman’s amazing Serenity Blue. I wouldn’t recommend a quirky boutique ink such as Noodler’s. For the more business-savvy a dark black or blue ink is spectacular in these pens. 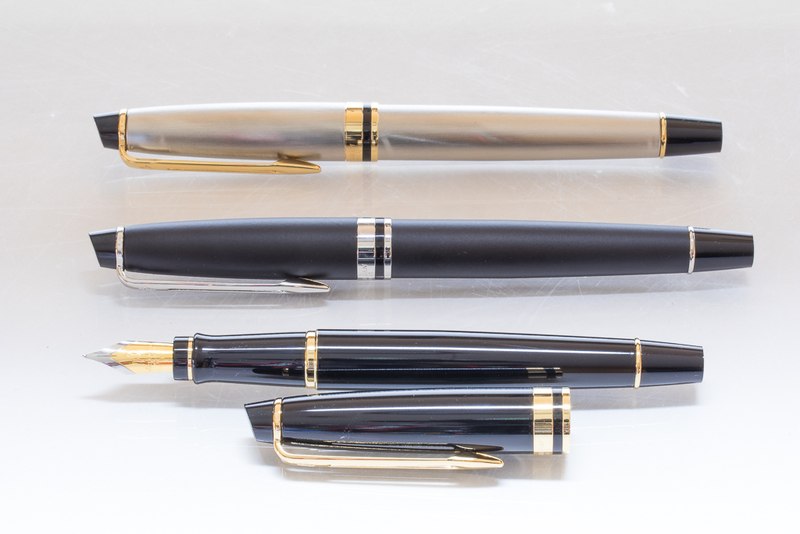 Whether it’s a gift for yourself, a friend or business associate, these new Waterman pens are sure to please.